More than 500 exhibitors from 14 countries and regions will showcase an extensive range of yarn and fibre products at the Shanghai National Exhibition and Convention Center next week. These exhibitors, as the largest gathering ever seen at the fair, are set to welcome a wide variety of visitors throughout the textiles supply chain from 15-17 October, solidifying the status of Yarn Expo as the leading first stop of every textile sourcing season. The fair will take place this edition alongside ITMA Asia + CITME. “For those looking for the industry’s latest innovations, Yarn Expo Autumn is the place to be. The reliability of buyer quality has once again attracted big-name industry players – including PT Indo-Rama, Chemtax, Shandong Ruyi, Jiangsu Shenghong and Jilin Chemical Fiber Group – who choose the fair as a platform to debut new products each year,” say organisers. The fair’s product groups have also expanded in recent years, reflecting market needs, to now include: natural fibres (cotton, wool, silk and flax/ramie); man-made fibres (regenerated and synthetic); specialty fibres; natural and blend yarns (cotton, wool, silk and linen/ramie); man-made and blend yarns (regenerated and synthetic); elastic yarns; fancy yarns; and specialty yarns. Significant new business partnerships in the yarn and fibre industry are anticipated at the fair, with new international sourcing options this edition. Highlighted big-name newcomers at the fair include Safilin from France, offering premium linen products, and Italy’s Sinterama Asia, which will show its range of 1,200 diverse chemical fibres and end uses. One of the world’s largest single site spinners, Novetex Textiles, from Hong Kong, will feature super soft merino in a wide range of colours, along with sustainable options in glen merino and 100% lamb’s wool. 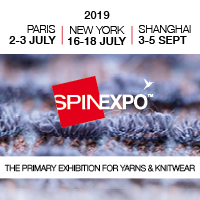 Another not-to-be-missed highlight is Parkdale Mills, from the US, a leading manufacturer of spun yarns, which will showcase cotton varieties, such as open end fibres, ring spun, air jet and vortex, in different blends. Another international must-see is the Pakistan Zone, returning to the fair this year with a strong collection of the country’s leading yarn and fibre exhibitors. Highlights include Abtex International, which will showcase their new mélange blends and fancy yarns, Fabcot’s cotton yarns and greige fabrics, and International Textile’s 100% MJS yarn and fabrics. Meanwhile, Texstyle will be a worthwhile visit for those in keeping with sustainability trends, as it will highlight its recycled and regenerated yarns from cotton, polyester, acrylic and wool. Joining them are more than 50 exhibitors in the India Pavilion, organised by Texprocil, while domestic exhibitors can be found at the Fancy Yarn Zone, Chemical Fibre Zone, Cotton Yarn Zone and Wool/Linen Zone. Group pavilions at the fair include the Sateri Pavilion and Birla Satellite.